Google isn’t the only company working on new deep learning techniques or applications, either. Companies such as Ersatz and the aforementioned AlchemyAPI are exposing the technology as commercial products, and web companies like Baidu and Microsoft are hard at work on their own research efforts. And here’s something really neat: there are some new papers to be presented at the upcoming NIPS conference that will take things much further — no about language translation per se; but, more generally, about what you can get out of vector space embeddings of entities. The old record was about 76%; the new record is near 90%! The kind of thing this can be used to do is to fill in missing relations in Knowlege Graphs; or verify existing relations — now with much greater accuracy. Imagine: when IBM’s Watson answered a question incorrectly, thinking Toronto was a U.S. city — what if it were given common sense, and allowed to ascertain how likely (Toronto, iscityof, US) is a valid relation? It would not have missed that question (answer). Now imagine what it would mean if question-answering systems, in general, were given common sense reasoning capability. This new result goes a some ways towards addressing that. This paper explains how they have greatly improved the continuous skip-gram algorithm, so that it gives much better vector representations, and can even handle phrases like “Air Canada” (whose meaning can’t be discerned just from the words “air” and “Canada”). 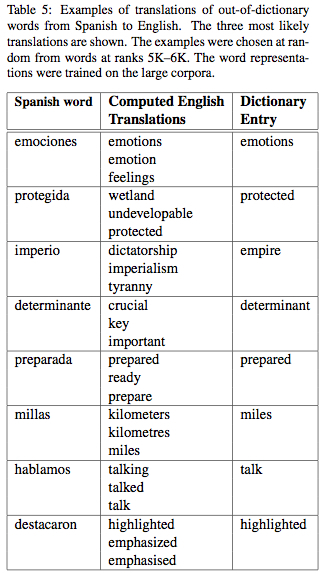 The work that’s being done with language models right now really is a breakthrough of its own. 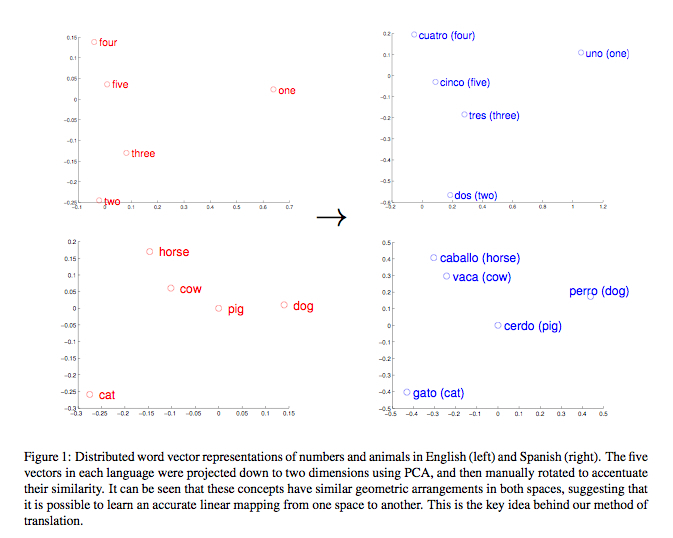 We’ve known that we can build models where the word “one” and “two” automatically learn that they are pretty close to each other in “vector space”–but now it turns out that you can use other languages to flesh out those similarities and differences even more. There are a lot of directions this can go–people might take learned object representations (say, by watching youtube videos) and find that they can be combined with those language models to improve language processing and vice versa (text data helps improve vision performance). In 2013, deep learning has started entering the limelight but it’s still a very abstract thing for most people. The “killer app” of deep learning doesn’t exist yet, but I’d be very surprised if it doesn’t make use of these types of concepts and involve some non-trivial NLP.